Καθολικός διάκονος: "follow his steps to the fullest truth of my Easter"
"follow his steps to the fullest truth of my Easter"
As the title of a very good book by Fr. Gustavo Gutiérrez, OP, puts it, God is The God of Life. Our readings today, all of them, including our Psalm, declare this. In our first reading from the First Book of Kings and in our reading from St. Luke's Gospel a widow has lost her only son to death. Added to the incomprehensible pain of a mother losing her child is the reality that in both of these instances the women, being widows, lost their sole means of support. This was a harsh reality for women then, as it remains for women in certain parts of the world today. It might mean something as drastic as becoming a beggar, or, perhaps turning to prostitution. It was a serious matter that we shouldn't simply dismiss by noting that there was no "social safety net" in ancient Israel, or in what was, in the first century, known as the Roman province of Palestine. When we consider these two women in light of our Psalm response, we can say that, with their sons who were raised from the dead, they could proclaim with deep gratitude- "I will praise you, Lord, for you have rescued me." 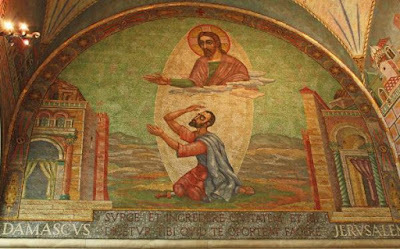 At the end of the first reading the widow declares, after Elijah raised her son, "Now indeed I know that you are a man of God, and it is truly the word of the LORD that you speak" (1 Kings 17:24). Our Gospel today tells that after Jesus raised the widow's son from the dead and "gave him to his mother," those who witnessed the miracle proclaimed, "'A great prophet has arisen in our midst,' and 'God has visited his people'" (Luke 7:16). God- who is Father, Son, and Holy Spirit- is not merely the God of life, God is life. Without God there is nothing. Without God there could be nothing. Why? Because nothing from nothing is nothing: 1,000,000 x 0 = 0. When he finally made it to Rome and appealed his death sentence to the emperor (I believe Paul thought he would be acquitted and then use Rome as his base for further missionary journeys), Paul was not spared. While I can imagine Paul being disappointed by his appeal being denied, I think it would only be his concern for the spread of the Gospel that caused it. How can this be? Because he had already died, been buried, and risen with Christ! After his conversion, Paul lived with the fearless freedom with which every Christian is called to live. A more contemporary example of this can be found in the witness of the Cistercian monks of Tibhirine, Algeria, who were killed by Islamist militants 20 years ago this year. In the beautiful film made about them, Of Gods and Men, there is a particular scene in which Frère Luc Dochier, the doctor, who is old and in poor health, tells his abbot, Dom Christian, that he is firmly resolved to remain at the monastery despite the danger to his life, but he understands if others want to leave. At the end of the conversation, he declares himself a free man because he doesn't fear death. Therefore, he is free to remain serving the poor Muslims, as well as the odd wounded Islamist fighter, in the name of Christ and for the sake of the Gospel. Seven monks, including Luc and Christian, were taken from the monastery in a nighttime raid conducted by the Islamist group fighting the Algerian government and were later executed in very much the same way we see ISIS murder people today. We must not reduce the proclamation of the Good News to merely engaging in a discourse. We must embody, that is, incarnate the Good News. Then, like Elijah, on whose presence the widow of Zarapheth initially blamed the death of her son (and indirectly on God), like Paul, like the Cistercian martyrs of Algeria, when we speak we can speak with credibility and the power of God, which is the power of love and nothing else. Today, 4 June, marks the 20th anniversary of the funeral and burial of what of the monks' remains were recovered. Muslim villagers, the ones the monks had served so diligently and sacrificially, to the point of laying down their lives, lovingly dug seven graves in the monastic cemetery of the then-abandoned monastery. Not long before being captured and then killed, the monastery's abbot, Dom Christian de Chergé, wrote at the end of one of his poems: "Finally, my friends, let's get it straight: I belong to him and follow his steps to the fullest truth of my Easter." Several years ago, the husband of a friend from high school, who she was in the process of divorcing at the time, committed suicide. You can imagine the pain and perhaps the guilt she felt. One day she asked me how I could believe in life eternal, specifically in the resurrection. While I can't recall the exact words I used, I said something like, "In order for resurrection to be more than a wish it is necessary to experience it. That way it becomes a reality, a part of your experience." This is why those who have experienced the gift of new life, like Paul, with the Psalmist, can rejoice, singing: "You changed my mourning into dancing; O LORD, my God, forever will I give you thanks."